Swalwell joins the presidential field with gun control at the top of his agenda. Rep. Eric Swalwell, D-Calif., joined the pool of 2020 Democratic presidential candidates after making a long-anticipated announcement on "The Late Show" with Stephen Colbert. "It's official," Swalwell said on the show. "Boy did it feel good to say that." At the top of his agenda is gun control and the day after his announcement, Swalwell was holding a Town Hall to End Gun Violence in Sunrise, Florida, with Marjory Stoneman Douglas High School students and families. The Parkland, Florida school was the scene of a mass shooting. Seventeen people were killed in the 2018 massacre. In February, Swalwell re-introduced a bill to protect victims of domestic violence from gun violence. A week ahead of Swalwell announcing his run for the White House, he shared a 47-second long voicemail message on Twitter that threatened his life. "Eric Swalwell ... here’s a little ditty for ya… Pop pop popbop pop pop, thirty round clip. You’re all gonna drop," the caller said. In that same tweet, Swalwell wrote, "I'm not afraid of this guy. I'm not afraid of the NRA. I'm not afraid. No fear. #EndGunViolence"
Swalwell was originally born in Sac City, Iowa but grew up in the East Bay area of California. His father is a retired police officer and his mother is an administrative assistant. Swalwell is the oldest of four boys and became the first person in his family to attend college, having received a Division I soccer scholarship according to the biography on his U.S. House of Representatives page. He graduated from University of Maryland in College Park, Maryland in 2003 and from the University of Maryland School of Law in Baltimore in 2006. In 2012, he defeated Rep. Pete Stark, who had served in Congress for 40 years. It was the first election cycle under California’s top-two primary system, where the top two finishers, regardless of party, advance to the general election, according to FiveThirtyEight. 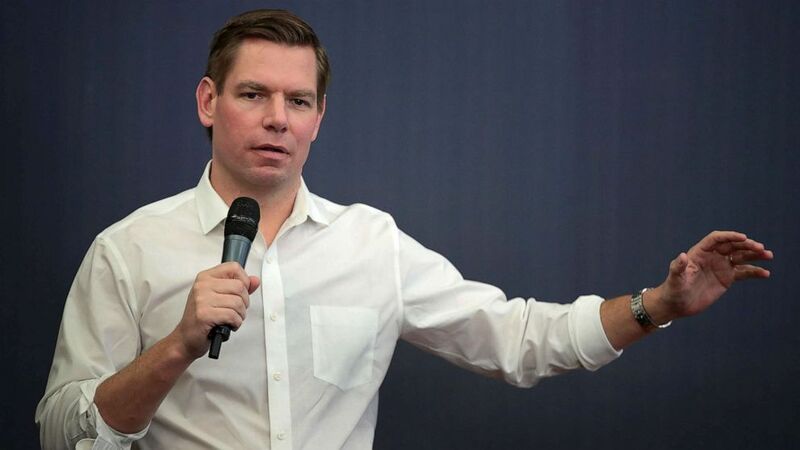 Swalwell continues to represent the 15th Congressional District and currently serves on the House Permanent Select Committee on Intelligence, where he is chairman of the Intelligence Modernization and Readiness Subcommittee. In 2015, he founded the "Future Forum," a group of 50 young House Democratic members who are focused on addressing issues for and giving opportunities to millennial Americans. After earning a law degree in Maryland, he served as a prosecutor in the Alameda County District Attorney's Office in California for seven years, starting in 2006. Since early 2017, Swalwell has visited Iowa, the first state to hold a presidential nominating contest, at least 16 times, according to FiveThirtyEight. His visits there appear to be paying off and according to a March 2019 poll, 29 percent of likely Democratic Iowa caucus-goers know enough about Swalwell to form an opinion of him. However, in that same poll, he would only receive 1 percent of the vote.